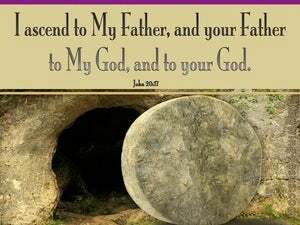 ﻿ John 20:17 Jesus said to her, "Stop clinging to Me, for I have not yet ascended to the Father; but go to My brethren and say to them, 'I ascend to My Father and your Father, and My God and your God.'" "Don't cling to Me," Jesus told her, "for I have not yet ascended to the Father. 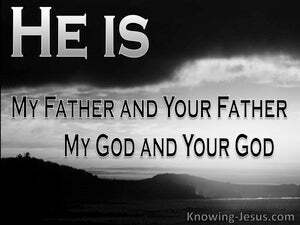 But go to My brothers and tell them that I am ascending to My Father and your Father-to My God and your God." Jesus says to her, Do not touch me, for I have not yet ascended to my Father. But go to my brothers, and say to them, I ascend to my Father and your Father, and my God and your God. Jesus said to her, Do not cling to Me [do not hold Me], for I have not yet ascended to the Father. 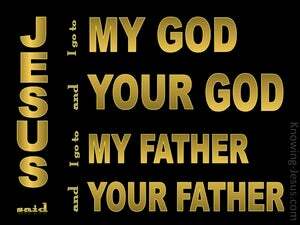 But go to My brethren and tell them, I am ascending to My Father and your Father, and to My God and your God. Jesus said to her, "Do not hold on to me, for I have not ascended to the Father yet [Note: Apparently Jesus was discouraging Mary from embracing Him in worship as was done in Matt. 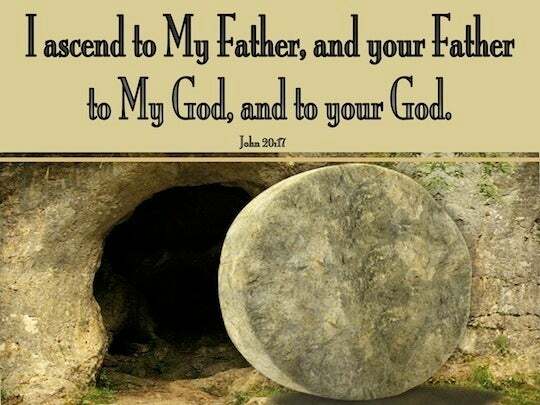 28:9, and thereby causing a delay of when the rest of the disciples would learn of His resurrection], but go to my brothers and tell them [I said] 'I am [about] to ascend to my Father and to your Father, and to my God and your God.'" Jesus said to her: Touch me not, for I have not yet ascended to my Father: but go to my brethren, and say to them, I ascend to my Father and your Father, and to my God and your God. Jesus said to her, "Do not hold me, for I have not yet ascended to the Father; but go to my brethren and say to them, "I am ascending to my Father and your Father, to my God and your God.'" that is to say, master! Jesus said to her, touch me not: for I am not yet ascended to my father: but go to my brethren, and say to them, "I ascend unto my father and your father, even my God and your God." Jesus says to her, Touch me not, for I have not yet ascended to my Father; but go to my brethren and say to them, I ascend to my Father and your Father, and to my God and your God. Jesus says to her, Cling not to me; for I have not ascended to my Father: but go to my brethren, and tell them, I ascend to my Father and your Father, and my God and your God. Jesus said to her, "You must not cling to me, for I have not yet gone up to my Father, but go to my brothers and say to them that I am going up to my Father and your Father, to my God and your God." She turning, saith to him, Rabboni; that is, Master. Jesus saith to her, Touch me not; for I am not yet ascended to my Father. But go to my brethren and say to them, I ascend to my Father and your Father, and to my God and your God. Jesus says to her, Touch me not; for I have not yet ascended to my Father: and go thou to my brethren, and say to them, I ascend to my Father, and your Father; to my God, and your God. Jesus said to her, "Do not touch me, for I have not yet ascended to the Father. But go to my brothers and tell them, 'I am ascending to my Father and your Father, and my God and your God.'" Jesus said to her, Do not touch Me, for I have not yet ascended to My Father. But go to My brothers and say to them, I ascend to My Father and Your Father, and to My God and your God. 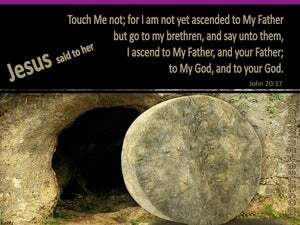 Jesus said unto her, "Touch me not, for I am not yet ascended to my father. But go to my brethren and say unto them, I ascend unto my father, and your father: to my God and your God." Jesus said, "Cease clinging to me. I have not ascended yet to the Father, but go to my brothers and tell them, 'I am ascending to my Father and yours, to my God and yours.'" "Do not cling to me," said Jesus, "for I am not yet ascended to the Father. But go to my brothers and say to them, "'I am ascending to my Father and your Father, to my God and your God.'" Jesus saith to her, Touch me not; for I have not yet ascended to the Father; but go to my brethren, and say to them, I ascend to my Father and your Father, and my God and your God. Jesus said to her, Do not touch me; for I have not yet ascended to the Father; but go to my brothers and tell them, I ascend to my Father and your Father, and my God and your God. Jesus saith unto her - Be not detaining me, for, not yet, have I ascended unto the Father; but be going unto my disciples, and say unto them - I am ascending unto my Father and your Father, and my God and your God. Jesus saith to her, Touch me not; for I have not yet ascended to my Father: but go to my brethren, and tell them, I am ascending to my Father, and your Father; to my God, and your God. "Do not hold me," Jesus said; "for I have not yet ascended to the Father. But go to my Brothers, and tell them that I am ascending to him who is my Father and their Father, my God and their God." Jesus said to her, "Stop clinging to me so, for I have not yet gone up to my Father; but go to my brothers and tell them that I am going up to my Father and your Father, to my God and your God." Jesus saith to her, "Touch Me not; for I have not yet ascended to My Father; but go to My brethren, and say to them, "I ascend to My Father and your Father, and to My God and your God." Jesus saith unto her, Touch me not now; for I am not yet ascended to my Father; but go directly to my brethren, and tell them, "I am to ascend to my Father and your Father, and to my God and your God." 16 Jesus said to her, "Mary!" She turned and said to Him in Hebrew, "Rabboni!" (which means, Teacher). 17 Jesus said to her, "Stop clinging to Me, for I have not yet ascended to the Father; but go to My brethren and say to them, 'I ascend to My Father and your Father, and My God and your God.'" 18 Mary Magdalene came, announcing to the disciples, "I have seen the Lord," and that He had said these things to her. "You heard that I said to you, 'I go away, and I will come to you ' If you loved Me, you would have rejoiced because I go to the Father, for the Father is greater than I.